2. To act habitually in conformity to. It is amazing how many Christians are good at confessing their faith in God but miss out on the fact that God intends for them to live by that same faith (Romans 1:17). 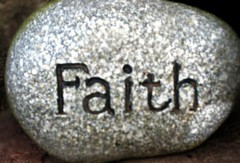 To live by faith is to allow your confidence in God, His love, and His power, to guide and fulfill your life. To live by faith is to live by the power of the Word of God…who cannot fail! Not only that but it is also being constantly or habitually in conformity to the Will of God according to His Word. Now neither you nor I know the entirety of God’s Word. However, we are responsible to “search the scriptures”—John 5:39; and to walk in the light of that Word which is known. The Word of God contains His plan for our lives. To tap into that plan is what will turn our lives from average to extraordinary! It will answer questions that have been shrouded in a cloud of mystery for far too long. The mystery is there because throughout the ages, men have created their own explanation for those things they don’t understand instead of turning to the Word of God…which has all of the answers. For instance, if a person were to get a ‘bad report’ from the doctor; they could turn to the Word of God and see that God says, “I am the Lord who heals you” (Exodus 15:26), and choose to believe the Word and place it in higher priority than the report—this is what it means to live by faith. Wow, what a concept! Turn to God for life’s dilemma’s and choose to believe Him, instead of being plagued with worry and uncertainty because of something that only He can do anything about anyway! There are two elements we have the choice to live by; one is facts and the other is truth. The doctor’s report is based upon facts, but the Word is always truth…and truth is higher than the facts! This isn’t meant to demean any doctor…they are working within the system of this world and God bless them for what they do; but then again, doctors know that they do not heal. On the other hand Jesus, through the power of faith in His Word does! Jesus said, while praying in John 17, “sanctify them through thy truth, thy word is truth” (vs. 17 – KJV). Moreover, medical reports are not the only place we are faced with facts vs. truth. Another area is our finances. This is another place where the enemy has a stranglehold on people—Believers included. The financial/economic system, like the medical, is a system in which we have been taught to trust. Many of us were told that if we went to school, got a job or started a business, and worked hard, everything would work out for us. However, many of us have followed that formula and it did not work out. Nonetheless, when we follow the truth outlined in God’s Word, every facet of poverty, lay-offs, unemployment or underemployment, rising cost of living, etc., etc., pales in comparison and actually fails to compare to the truth of victory through God’s Word! Having faith and living in and by it will change every fact in your life! When faced with facts, grab the truth…find out what the Word says about the situation you are facing and stand on that (the Word)…instead of the facts! Lest I be misunderstood, I did not say to ignore the facts but rather—BELIEVE THE TRUTH. In other words, believe in what God says more than whatever facts are screaming at you. This is putting your faith in action…this is living by faith! My Brother, just one word, “AWESOME”! I always enjoy reading your post and the truth of your words backed up with scriptural references. Keep up the good works. “report is based upon facts, but the Word is always truth…and truth is higher than the facts!” I love that statement; a great reminder of Who comes first! Yes we know Faith without works is dead, we show our faith in actions because Love which is the essence of Faith, is an action not just a word. .About 3 weeks ago I was in extreme pain for 3 days and could not walk, the Doctor said it was the cold weather affecting my condition and increasing the pain and apart from strong pain relief there was nothing they could do for me, she also ordered a Lumber X-ray again, I have them every year. I asked our friends to pray for me that night and used the healing Balm that Peter had received from God and in the morning I had no pain in my back and could walk again and I still don’t have pain there and the X-ray showed there was no sign of the increasing arthritic degeneration that I use to have and wonderfully I will no longer be a Paraplegic. God has healed me Miraculously before more then once and they were Medically documented over a long period of time and some were life threatening but they also disappeared… Praise God from who all mercies flow. Yes Sebastian only God can heal and do good and those who are empowered by Him with this gifting. Satan destroys, lies, tricks and uses illusion to deceive because He is evil and can do no good, nor can those who are his children eternally. Loved this article! Thank you for the advice and direction you’ve provided on faith, a much needed topic of discussion. God bless you my brother!